While living in Jamaica I learned how to cook with the Scotch Bonnet Pepper, grown in every kitchen garden on the island and widely used throughout the Caribbean, the Scotch Bonnet is one of the hottest members of the habanera family. With a unique flavor, one that is unforgettable and which I am confident will become a favorite of yours. 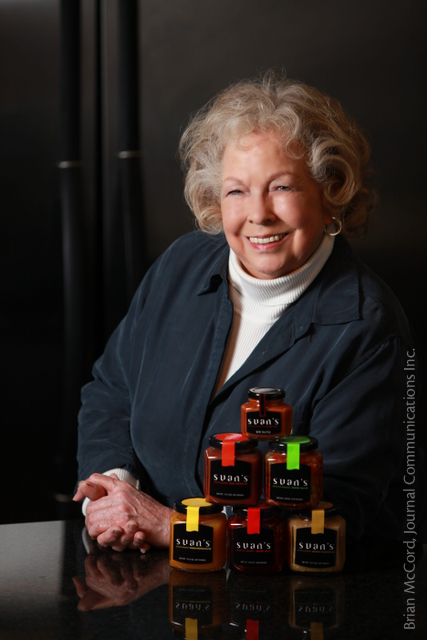 My company, Suan’s® Foods, Inc. is the maker of the delicious Suan’s® Scotch Bonnet Pepper Jelly and 6 other scotch bonnet pepper-based condiments. I have always enjoyed cooking for my family and friends so after years of treating them to the favorite Scotch Bonnet Pepper Jelly and hearing the response of “you should bottle this and sell it” became a reality after attending a one-day-seminar at the Robert M. Kerr Food & Agricultural Products Center at Oklahoma State University on food entrepreneurship, in February of 2009. I soon discovered that having the desire to follow your vision involved far more than ordering a few jars and filling them with this tantalizing jelly! So after months filled with the details of forming my company and perfecting the recipe I was ready to take that leap and present my product to the public. My daughter, Robin Wolf, is a potter and casually said to me in October of 2009,“why don’t we rent a booth at the National Reining Horse Association Show being held here? It would be a wonderful way to introduce your jelly and my pottery.” So with a flurry of activity, and anticipation we were able to obtain a booth at the NRHA Thanksgiving Day to December 5, 2009. We are very grateful to the NRHA for helping both of us develop our brands. For four years, my jelly and Robin's art went home with attendees from the United States, Canada, England, Mexico, France, Belgium, Brazil and other locations worldwide. I hope that after you try Suan’s® products, you too will discover the unique flavor and many uses for my jelly and know why it is a must have in every kitchen pantry! Visit my Recipes blog for ideas and send me your own recipes to suan@suansfoods.com. Thank you for your interest in Suan’s® products! I look forward to a long relationship in which we both can share our interest and ideas of my jelly and other scotch bonnet-based products: one where you are assured of only the finest product and highest quality when you see my name.